The movie is a very real, sweet at times and disturbing and sad at other times. It shows the glaring differences between the upper class and lower class [ Dont think the story is confined to just Delhi, it is true of any city across the world] This mix of worlds is seen by an outsider, a British guest who comes visiting, Jasper (Lee Williams). While the Bhatia family is upstairs battling with a broken down Air conditioner, their household help [Raghu, Chottu, Udai Singh, and Rohini] are already up and about. They are having some fun of their own in the kitchen, imitating the man & woman of the house, and generally unwinding before work takes over their lives. Kalpana Bhatia[ Lilette Dubey] is rudely awakened as the AC has broken down and she is feeling hot & sweaty, she calls out to the household help, but gets no response. As she marches towards the kitchen, she pauses upon hearing their chatter. Barges into the room and gives them all a earful, and orders to kick them into action. She runs them through instructions given earlier on occasion of Jasper visiting them. Jasper says he is staying with them just for a day, and is off to Banaras starting off his "explore India". He has quit his job, cashed in his savings, packed a backpack and landed at their doorstep. Kalpana insists her maid and cook pay extra attention, belting out specific orders- food, room, transport etc... Their drivers are tamilians, and one guy, Nataraj in particular is so afraid he keeps saying "i dont want this job, i shall go back home". Jasper wants to roam around Delhi on foot and local transport, but Kalpana will not hear of it. Rohini [Anjali Patel] is a village girl with dreams in her eyes, she aspires to become a movie actress [dances and performs in the kitchen and whenever they are away from work] Raghu Kaka, is almost like her father, an old frail man who's been with the Bhatia family for generations. Towards evening when Jasper returns to the Bhatia home, he discovers his money envelope completely empty, nearly 4000 pounds gone missing. He expresses concern to Kalpana who instantly calls to Rohini & Raghu Kaka asking them if they took the money. A discussion with Mukund [Kulbhushan Kharbanda] and they decide that no matter what the money has to be returned- she points a finger at Raghu kaka saying he must have taken it, tempted and with desire to get Rohini married off. Her husband says "else,we will have to repay the money to Jasper, cant have our name tarnished because of someone's misdeed"
While the Bhatia's have come to a concensus on this, it is the household help who are in a mess. Rohini is worried for her kaka, a man who has been more than a father to her. She decides to raise some money, going off into the narrow shady alleys of the village nearby only to return empty handed. Jasper on seeing her crying near their hut, understands the position and makes matters right. Even when Kalpana comes to know of the truth, she continues to muddle over what is the right thing to do... Reveal the true culprit or pray that Kaka manages to round up the money and return it to Jasper. It comes as a surprise when Jasper does what he does before bidding them adieu. 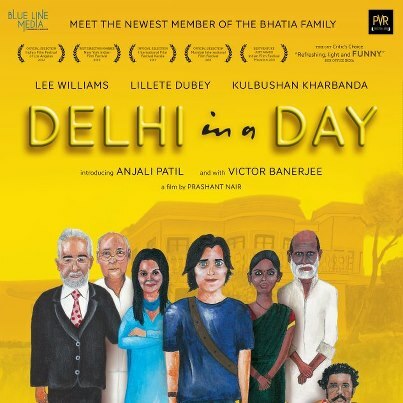 Delhi in a Day is a movie that gives you a reality check into the lives of our domestic help- what they go through, their struggles, fears, hopes, anger and how they fall pray to upper class thrashings for no fault of theirs. They work hard, are polite and mannered, taking on whatever words thrown at them, but in privacy do make fun of their employers and have their own kind of fun. Kulbhushan Kharbanda & Lilette Dubey are perfect as the Delhi-Punjabi family heads, with no cliches or over the top dramas. Anjali Patil stood out among the other set of actors, she was so expressive with her eyes and innocent smile. Being the only girl among the all male household help, it is beautiful to see how the others care about her and protect her. Jasper too in the movie is smitten by her beauty and innocence.